Mark Bittman, author of the NYTimes column, The Minimalist, and the indispensable How to Cook Everything. The Best Recipes in the World is just you'd expect from Bittman--a collection of recipes from around the world, presented in a familar "Minimalist" format including ingredients that can be easily found at your neighborhood grocery store, suggested variations, and each coded to indicate whether it is "make ahead," "serve at room temp./cold," or "30 minutes or less." The cookbook is organized in the traditional cookbook format--by course. I think this makes sense because it's familar to most of us, but I've already bookmarked the "Recipes by Cuisine" index in the back of the cookbook. Browsing by cuisine is how this belly works. Masala Winter Squash was the first recipe I tried. I don't cook winter squash that often, but it came in our bi-weekly fruit and veggie box delivery, so I was happy to experiment.The recipe was easy to follow and the end result belly satisfying. Pinoy Cook: "The idea of grilling adobo was something I picked up from Mark Bittman’s The Best Recipes in the World. When I read it, my first reaction was to raise my eyebrows. Like, here’s another foreigner bastarizing my country’s beloved adobo. But then I considered if his innovations detracted from the adoboness of adobo to justify judging it as a bastarized recipe. Truth is, despite sounding different, it was adobo through and through. . ."
Snack Blog: ". . . The international pantry section is particularly helpful and it seems the key to global cooking, as Bittman points out, most techniques are universal, it’s the ingredients that make the difference." 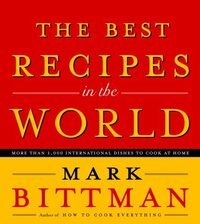 Related: Bittman answers questions on cooking global cuisine. WSJ rounds up your dining options at airports around the country.
. . . That's in part due to the company's feeble use of the web. There are alternatives available online that are free, more up-to-date, and more edifyingly free-wheeling than the ludicrous Zagat formula of one sentence per restaurant. Much more useful information is available from sites such as eGullet, Eater, Epicurious, Chowhound, Menu Pages, and bloggers like Andrea Strong. Zagat's time as a central culinary touchstone has passed. Wow. Photos of the new menu at Chicago's Alinea. This is no ordinary menu. Don't miss the Idiazabal cheese. Visualrecipes.com: "Steve the Pumpkin" becomes pumpkin cheesecake. 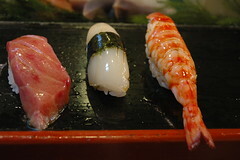 Ask Metafilter: Fact or fiction : All (or most) NYC restaurants get their fish deliveries on the same day every week. 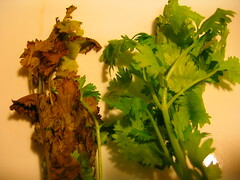 Read the rest of the details of beXn's nearly scientific cilantro storage test. If you enjoy Zagat Survey and wish you could browse their online reviews for free, your wish will be granted November 1st-7th when you'll be able to sign up for free access. McSweeney's Reviews of New Foods. You will laugh, at least once. Reminds me of my experience with Reed's Ginger Ice Cream this weekend. Somehow, they've managed to capture the worst kind of ginger beer flavor (and I like ginger! ), and stick it in ice cream. Not recommended. Mike's Japan food diary as documented on Flickr.